Am I the only one feeling like winter will never end? I'm wishing for signs of spring and although there aren't any to be found outside, I can pretend inside. This sunny salad is so delicious, you'll be out of the winter doldrums in a snap, proclaiming "Winter, schminter!" I adapted this from a Rachael Ray recipe. I'm not a big fan of hers. Truth be told, I can't watch her show because she annoys the hell out of me. I found this recipe when I was doing a search one day a few years ago. It's simple and uses just a few ingredients, but is very yummy. Winter be damned! In a small bowl, whisk together the marmalade and red wine vinegar until fairly well blended. Stream the oil into the salad while whisking. Season with salt and pepper. In a large salad bowl, toss the spinach, onion & fennel with a little of the dressing. Top with oranges and almonds and dribble a little more dressing on top. Serve. Well hello everyone! I haven't posted in weeks, but I don't think I was missed all that much. The traffic on this blog is minimal and I'm not doing a whole lot to promote it. It's sometimes difficult to find the time to work on this. I have the best of intentions, but time gets away from me. We muddled through Christmas, me with a sore back, then a cold which I passed onto Jim. He's also been doing physio for torn tendons in his shoulder, and we did a dog sitting stint. And it seems like every day I have to clean snow off the car. As much as I like winter, this year it has been a bit much. Extreme cold with quite a bit of snow has everyone wishing for green grass and sunshine. But there is nothing like warm, comforting, hearty meals to take the chill off. Chili always hits the spot. It's very hearty with warming spices and it's a great way to use up bits of things hanging around it your fridge and/or pantry.While puttering around home, I made a big pot of Chocolate Chipotle Chili from The Urban Vegan then topped it with a cornmeal crust and had a 'Chili Pot Pie'. I've been making this dish for years. It's a variation on a recipe that I clipped from Canadian Living magazine in 1995! (I meant it when I said years) The chili part can be whichever recipe is your favourite. Put enough chili into a casserole dish, that is approx. 3 quart size, to fill roughly 2/3 of the dish (you want a decent chili to topping ratio) then just top it with the crust. Mix together flour, cornmeal, sugar, baking powder and salt. Cut in butter until mixture is crumbly. Mix in cheese. Beat egg with milk and stir into flour mixture until blended. Spread evenly over chili. Sprinkle with parsley. Bake in 375°F oven for about 25 minutes or unitl crust is golden bown. *Sometimes, for no apparent reason, things go crazy with baking and I will occasionally find this batter too thick. If that's the case, it sometimes doesn't bake through the middle. I will either add a couple of tablespoons of extra milk to thin out the batter, or if the top is nicely browned but not fully cooked, cover with foil and let bake another 10 minutes or so. As the winter weather descends upon us, nothing is more cosy than puttering around home while delicious food slow cooks in the oven, releasing aromatic scents that soothe the soul. Everyone has different ideas of comfort food depending on nationality, heritage, or what part of the country you come from. Some regions have specific cuisines that are synonymous with them - think Cajun in the Louisiana area of the US, Tex-Mex or the homey comforts I grew up with on east coast of Canada. Most of the ancestry there is British & French with a mix of European, and over time, the cuisines have melded together to make wonderfully delicious food. One thing that I really like is cabbage. Cooked or raw, both are delicious. Cabbage is sometimes looked down upon as a poor man's vegetable, but it kept our ancestors alive when times were so rough, we cannot even imagine. When it starts getting chilly outside, I make braised red cabbage. First a layer of finely sliced cabbage goes into an oven proof pot. I like to use my enamel-coated cast iron one for this. Then a layer of chopped apples & onions, some brown sugar, garlic & spices. Keep layering until the pot is full. And into the oven it goes for a couple of hours. When it's finished cooking, you have a delicious sweet and sour cabbage dish. This is wonderful hot or even at room temperature. It keeps well in the refrigerator for quite a few days and re-heats beautifully in the microwave. In a small bowl, mix together spices and brown sugar. Set aside. Remove core and tough outer leaves from cabbage. Shred or slice the cabbage very thinly. Arrange 1/3 of the cabbage in the bottom of an oven proof casserole. Top with a few shakes of salt and a few grinds of pepper. Then layer half of the apples, onions and garlic over the cabbage. On top of that, sprinkle half of the brown sugar & spice mixture. Continue layers, ending with red cabbage on top. Pour on the vinegar and dot the top with butter. Put the lid on and braise in the oven for 2-2½ hours, stirring a couple of times. Nachos are a favourite around here. They are so versatile you can put whatever you like on top. Most ingredients are already in the house anyway, so a plate can be made up pretty much anytime. I usually go with onions, peppers, black beans, jalapenos, cheese - pretty standard, but oh, so tasty. Sometimes, I'll do some vegetarian ground "beef" with taco seasoning and scatter that on top as well. And nachos have to be served with salsa and guacamole. That's a given. The guacamole that we like is from The Barefoot Contessa. It's pretty straightforward and pretty delicious. There are always arguments about whether tomatoes go into guac or not, but we're far from Mexican authentic, so we go with tomatoes. Add a margarita - another favourite - tart and tangy it goes perfectly and we're good for the night. Now, what to watch? Have you seen any good movies lately? Cut the avocados in half, remove the pits and scoop the flesh out of the shell into a large bowl. Immediately add the lemon juice and toss. (this keeps the avocados from turning brown). Add in the rest of the ingredients, except tomatoes and toss well. Using a sharp kife, slice through the avocados in the bowl until they are finely diced. Add the tomatoes. Mix well and taste for salt and pepper, adjusting if needed. Everyone loves shepherd's pie, don't they? It's also a super easy dish to make vegetarian. For a traditional type pie, most people will have the ingredients on hand already, it's not difficult to throw together, and is one of those wonderfully comforting dishes. Then, there are interesting twists on shepherd's pie. This is one of my favourites. It comes from Looneyspoons. It's Greek-inspired and delicious! The pretty coloured layers in this hearty pie are as appetizing as the taste. Yves Veggie Ground Round takes the place of ground beef for the crust and layers of tomatoes, spinach & cheese are topped with mashed potatoes. I like the potatoes when they're a little browned and crispy. Turning on the broiler for a few minutes at the end of the cooking time accomplishes that nicely. Just to amp things up on this batch, I decided to use up a couple of Daiya cheddar slices that I had. You could also use the shreds, but this is what I had in the fridge. I just chopped up the slices and added them to the potatoes while I was mashing them. They were still hot, so it melted the Daiya right in. Yummy! Or if you prefer, Opa! Cook potatoes in a large pot of boiling water until tender. Drain well. Add in salt & Daiya, then mash a bit to get the Daiya melted. Add milk and mash until smooth. Set aside. In a large bowl, combine Yves Veggie Ground Round, bread crumbs, onions, egg white, ketchup, garlic and pepper. Mix well (using your hands works best). Pat this mixture over the bottom and up the sides of a 9-inch pie plate. Layer tomato slices over the "crust". Sprinkle oregano over the tomatoes. Spread Swiss and feta cheeses over the tomatoes. Top cheese with chopped spinach. Spoon mashed potatoes over spinach and spread out evenly. Smooth the top and bake in a 350°F oven for 45 minutes. Let sit or 5 minutes or so before slicing into wedges. * If you wanted to make this completely vegan, you can easily switch out the milk and cheeses for non-dairy alternatives. I haven't tried it, but I imagine ground chia seeds that were mixed with water and allowed to sit until gelatinous would probably work as the binding agent to keep the crust together. As I mentioned, I'm recipe testing for Dreena Burton's new book that is due out late next year, and here's another sampling of what I've made. Zesty Raw Almond Sauce that I used to toss with some soba noodles & sautéed green onions, red peppers & snow peas. These were really easy and really tasty. 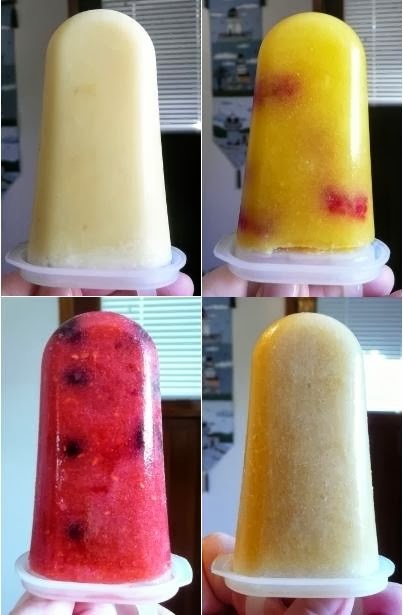 I had a few in the freezer when a mini heat wave hit us, and the fruitsicles really hit the spot. It's all looking delicious, isn't it? I think this book is going to be a smashing success. Oh Broccoli. A lot of people seem to dislike you. Yes, you have a bit of a strong taste and coming from the cabbage family, that is to be expected I suppose. But you have so much going for you. First off, you are kind of cute - you look like little trees. And you're also very high in Vitamin C, giving us more than 100% of our daily requirement. You also boast abundant amounts of Vitamin K and Vitamin A and are a good vegetable source for calcium. You also contain anti-carcinogenic compounds, but those get significantly destroyed if you're boiled, so we like to steam, roast, microwave or stir-fry you. Mmmmm....I'm thinking some people might be starting to feel your love. Let's amp it up and really get them hooked on you. Lightly steamed and drizzled with some yummy sauce, what's not to love? I'm thinking you'll be having a lot more dinner dates broccoli. To prepare the sauce, combine orange juice, honey and ginger in a small saucepan and bring to a boil. Add the cornstarch mixture, whisking while returning to a boil. Cook the sauce until thickened, about 1 minute. Remove pan from heat and stir in lemon juice and sesame oil. Meanwhile, steam broccoli until tender-crisp, about 5-6 minutes. 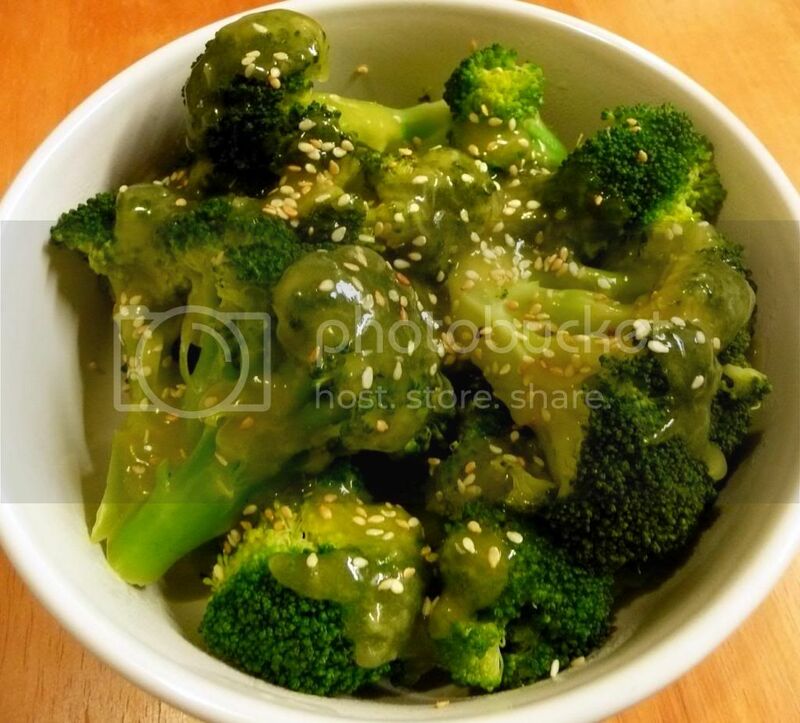 Arrange on a serving platter, pour sauce over broccoli and sprinkle with sesame seeds.